BBC Africa is reporting the country of Kenya is launching its first coast guard patrol in the history of the nation. 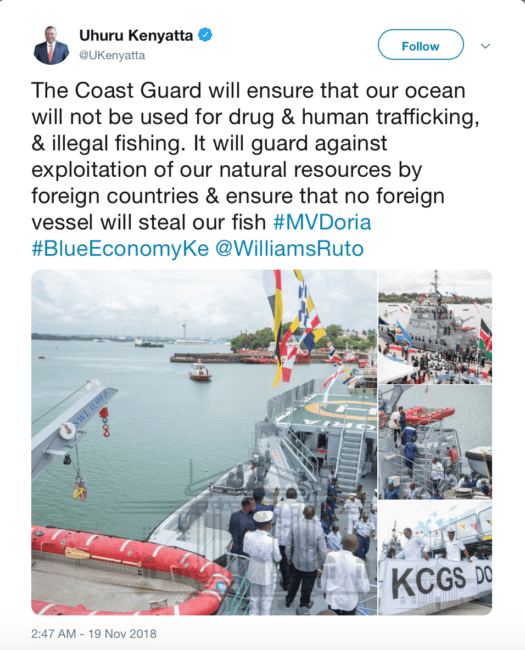 President Uhuru Kenyatta says this initiative is needed to protect and monitor its territorial waters. Prior to this announcement, Kenya’s territorial waters were previously monitored by the Navy. Launching the coast guard allows the navy to focus exclusively on security and military affairs once the coast guard is fully staffed and has a larger number of boats. The MV Doria will be used to guard against foreign vessels illegally fishing in Kenyan territory, drug and human trafficking. Read more at BBC Africa. Follow The Burton Wire on Instagram and Twitter @TheBurtonWire.